Cracking the code to the safe is hard enough. You better write down the misses as you go along! 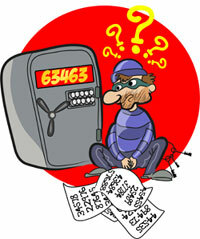 If you were trying to break into a safe that had a five-digit combination, how would you do it? Would you haphazardly guess at the sequence of numbers, hoping you’d stumble upon the correct digits in the right order? Not very efficient, right? Would you try to uncover any clues that might help you decipher what those numbers might be? A better approach, certainly, but still difficult. Knowing on what the combination was based—birthday, favorite numbers, anniversary maybe—is difficult enough. But then you’d need to figure out what the answer to those clues might be. Whatever approach taken, cracking the code of any safe is almost impossible. That’s a good thing, right? Unless you’re a thief, that is. With 100,000 combinations (10 possibilities, including ‘0’, for each digit, raised to the power of 5 for the number of digits in the combination), you have a better chance of becoming a pro athlete (a good thing: 1 in 22,000) or getting audited by the IRS (a bad thing: 1 in 175). But if you were stupid enough to try this feat, what would be the one thing you would have to do? Document all of the failed attempts. After all, if a combination is not correct, you surely don’t want to repeat it.